The following was originally published in 1989 in a book called Tacoma: Voices of the Past Volume 1. As the book is out of print and hard to find, I post this Tacoma Story here for others to find. Mary Olson’s description of Holy Rosary in the 1930s is both personal and historic. It’s interesting to hear how different things were and yet there are still many similarities. In January of 1930 my mother, Elizabeth Monta, was finally able to enroll me in the first grade of Holy Rosary School. I was eight years old and had learned to read and write at home. She had tried to start me in school the previous fall but the school was overcrowded and they would not accept any more students. Tuition was $4 a month. Dad worked it off by shingling the old house in back of the church which served as a convent. We did not wear uniforms as many of the parents could not afford to buy special clothing for school. Each year Mother bought me five cotton dresses and one pair of shoes. These had to last all year. The dresses were bought at the Dollar Store on Broadway and cost $1 each. I can’t remember where the shoes were purchased, possibly at Pessemier’s on Pacific. Stockings and vests, as little girl’s undershirts were called, were probably bought at Penneys, petticoats were made at home, usually out of flour sacks. I wore two pair of bloomers, one of flannel and an outer pair of black sateen! Long cotton stockings were held up by a kind of harness which fit over the shoulders. Sleeves had to reach the elbow and skirts to below the knee. These were not school rules, buy my mother’s! Some of my classmates wore sleeveless dresses and ankle socks but I was not allowed such modern and shameless fashions. I should add that I did not resent this as most of my friends dressed just as I did. Many lessons were learned by rote. In the first grade we sang the alphabet and sounded each letter, over and over. In later years, the times tables were learned the same way. I can still remember word for word, many questions and answers from the catechism. We had spelling bees, not only for spelling but for other subjects, too. Prizes were little holy cards. Every phase of school life had its own strict rules. School mornings started early. Mother called us at 6:00am and after a breakfast of mush with milk and sugar, or fired eggs and potatoes, we would go through sun or rain, sleet or snow, to the streetcar line, three blocks away from home, at South 78th and Yakima. Then came the long ride down Yakima to South 38th. Between South 48th and 38th on Yakima there were poles down the middle of the street carrying power lines for the streetcars. We were cautioned to keep our hands inside the car. No reaching out to touch the poles or this might result in our arms being torn from their sockets! We turned down 38th to G Street and then to the Delin Street Hill, getting off across from the church at Tacoma Avenue. The fare was 2½ cents a ride and Mother would give me two tickets every morning. If I lost the ticket, I walked home. Losing things like streetcar tickets, rain hats, umbrellas or school books, was something I did regularly. Many trips had to be made after school to the car barn at South 13th and A Street to retrieve things that I had carelessly left on the streetcar. Most doors were slammed in our faces but once in a while we would sell three to someone, and then, oh, how tickled we were! On arrival at school we went first to the coatroom where we hung up our coats, hats, scarves and put away our galoshes. Then to the schoolroom to put our books in our desks and down to the basement to get in line, each class in its’ own place, girls in front, boys behind. When all the grades were assembled, the pastor, Father Mark Weismann, would lead us in morning prayers. After that we all said the Pledge of Allegiance and sand the Star Spangled Banner. Then we all marched in formation to the church, were we sat according to grade. Boys on the right of the central aisle, girls to the left. First grade in the front pews and behind them the second grade and so on to the eight. The church was crowded. Parishioners, other than schoolchildren, sat on the side aisles or in the back. Each class was watched over by a Benedictine Nun and woe to the boy or girl who dared to laugh or whisper. Sister had a thimble on her finger and would reach out and whack him or her on the head with it. School was fun. I enjoyed learning new things, loved to read, and considered arithmetic a game. Once a week we had dancing or music lessons. I never learned to play an instrument but was given a triangle or notched sticks to keep time with. We were taught the musical scale in the second grade, again by rote, and taught to read simple music. I can still recall one of the little songs we sang to learn the scale, and have taught it to my grandchildren. “One I love, two I love, Daddy dear and Mother. Do do do, re re re, mi fa so, la la so. Three I love with all my heart, darling little brother. Once a year the school put on a show for the parents, to give us a chance to show off our skills. Oh, how proud we were in our costumes, going through our paces. I remember one year my class did a Dutch song and dance. That same year my brother, John, was a sailor and danced the hornpipe. Of course, there were many religious holy days and feast days. Then we girls were dressed in white dresses and veils. The boys wore dark suits with white shirts and dark ties. We marched into church carrying candles, singing hymns and feeling oh, so proud of ourselves. If there was a fight on the playground during recess the combatants were separated and sent to see the assistant pastor, Father Anthony. He would have them meet him after school in the alleyway to the east of the school building. There they would fight it out under his watchful eye. I never knew of a fight between girls. We were taught that we were young ladies and of course, would never do anything as crude as fighting! Even a tomboy like myself, who would fight at the drop of a hat in the neighborhood, would never have dreamed of fighting in school. Spankings were administered by the sisters with the blackboard pointer, or there might be swats on the open hand with a ruler. Usually punishment took the form of writing sentences during recess or after school. It took a lot of playtime to write, “I will not talk in school” 100 times. Sisters had all the time in the world to wait there until you finished it. Of course, they also had all the time needed to explain things that you were having trouble with. There were usually at least 30 children in each room and yet each child received all the individual attention they needed. Homework was an every night chore. It was done after supper, in the living room, seated on the piano bench and using a closed piano as a desk. This too was largely learning by rote. Spelling words were written ten times each. Catachism questions and answers were repeated over and over until they were learned by heart. We had geography and history lessons to study. We learned to write in First Grade. Printing was considered more an art from than something we would need in every day life. Now I have had the pleasure of watching four of my grandchildren attend that same grade school. What fun it has been to go back to the same classrooms in which I sat, some with the same saint’s statues watching over the children, like old friends there to welcome me back. Most of the sisters are gone and lovely young ladies now teach the children, who are a great deal bolder than we ever dared to be. But in reality very little has changed. Every year I attend the same type of show, and laugh and applaud to see the children showing off their newfound skills. And I know just how proud and happy they feel, for I’ve been there before them. 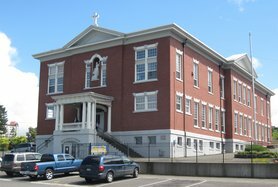 This entry was posted in Tacoma History, Tacoma Places and tagged 1930s, Holy Rosary School, Tacoma. Bookmark the permalink. Thank you so much for sharing. I love the fact you rode a light rail line to the school. Isn’t it amazing we had one and now we are fighting to get one back? Thank you for preserving a Tacoma story for all of us.